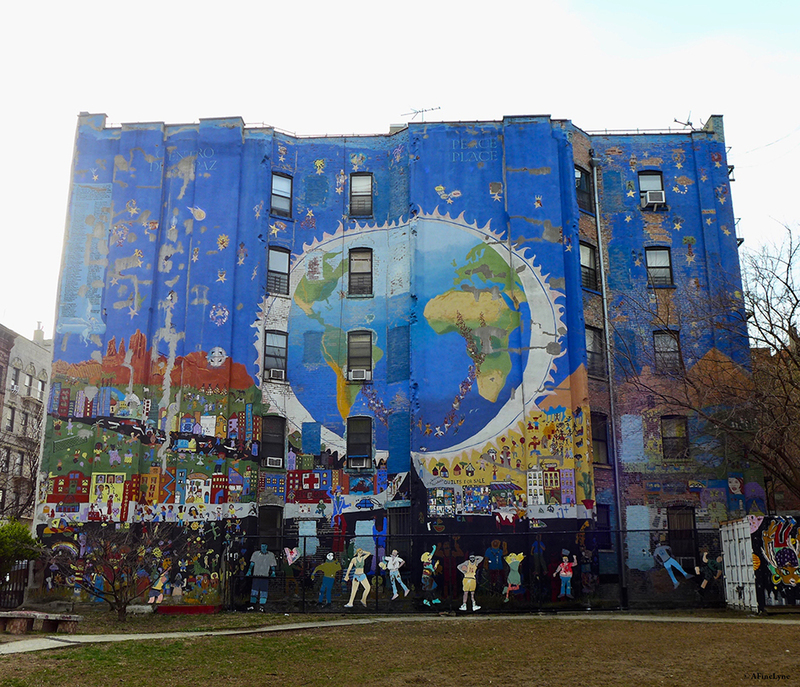 This story really began in 1989, when the nonprofit group, Creative Arts Workshop for Kids, raised money and organized 60 homeless children living in the city shelters and welfare hotels to create a mural in an empty lot. 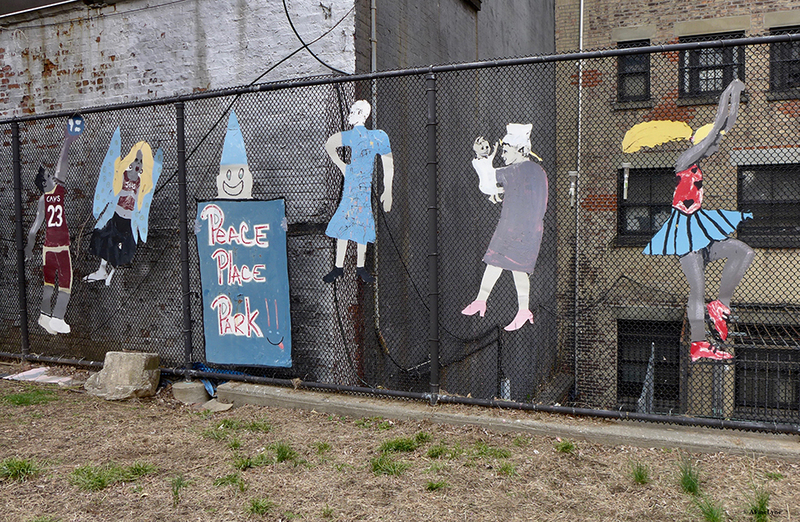 The kids painted their fantasy of a perfect city in a large empty lot on 124th Street and Lexington. The mural included children riding in limousines, characters from The Wizard of Oz, and Nike World. A true fantasy. But in the real world, that lot was purchased and developed into what is now the abandoned Pathmark superstore. 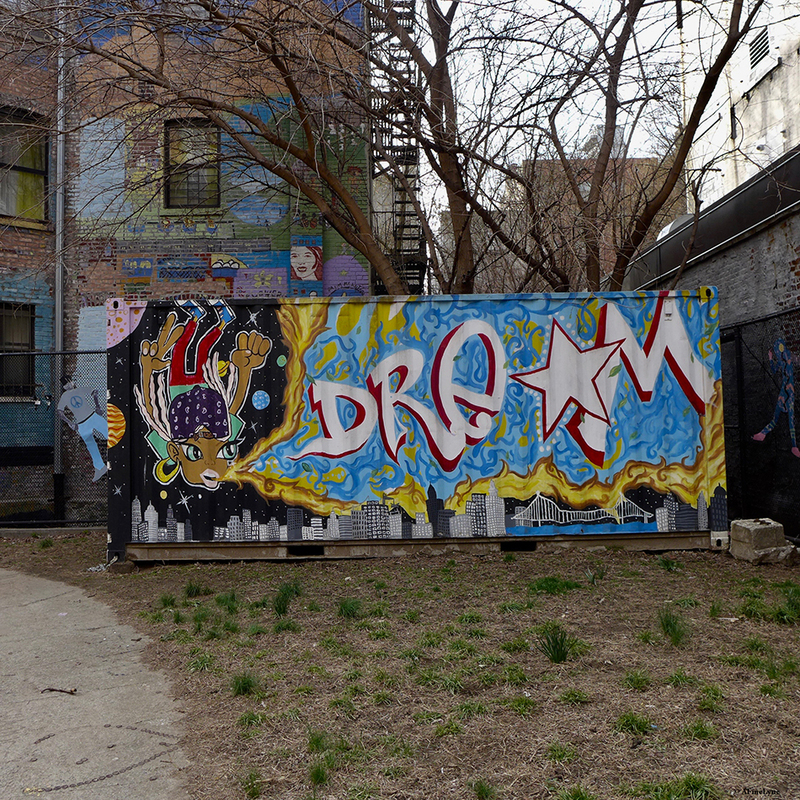 Not discouraged, Creative Arts Workshop for Kids moved down the block to the location we are in today, their second Dream Street Park ~ which was at the time named Peace Place Park. 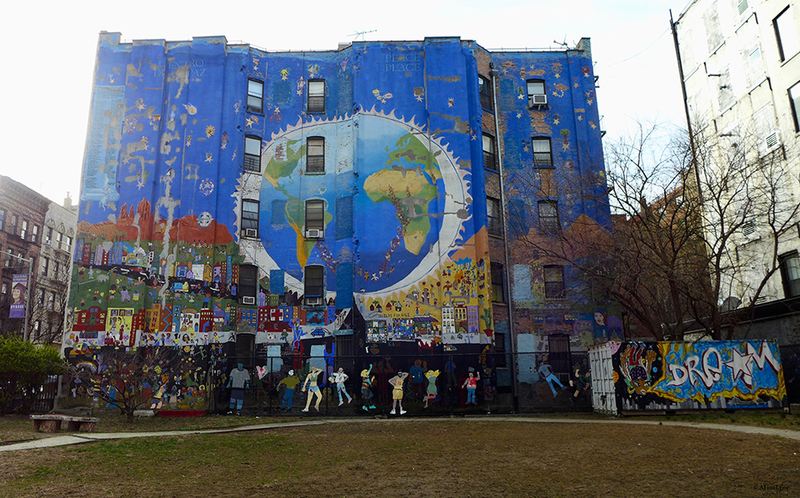 This time, with 80 children most of them homeless, they began a new mural, and this time the children painted a new vision, celebrating the city’s rich history, with avariety of cultures and images including African warriors and Egyptian pyramids, colorful quilts, blue blue skies and a globe of the world. 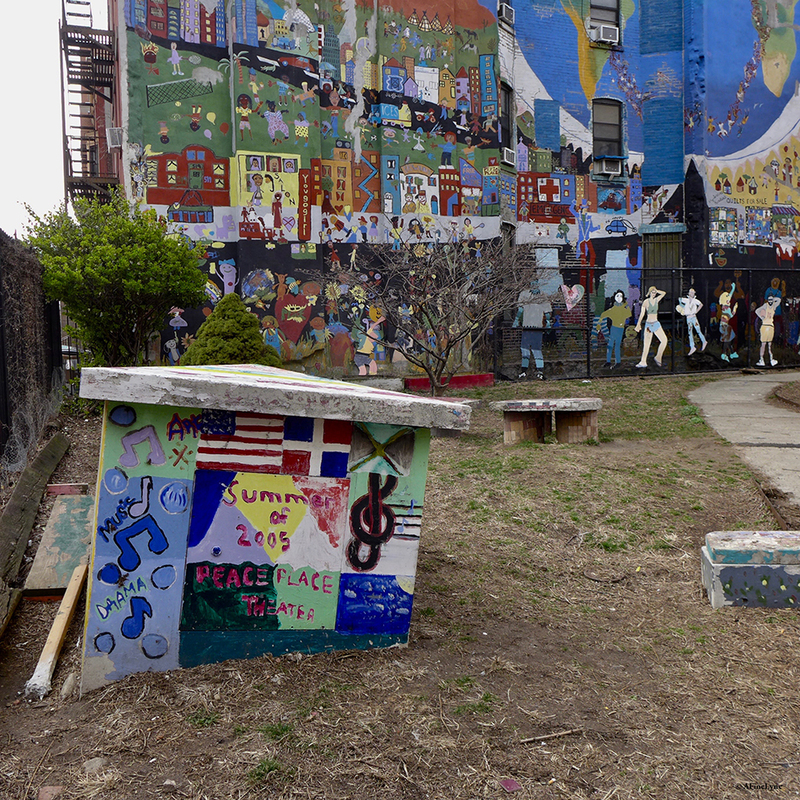 Mosaic benches and hand-painted figures line the perimeter of the park, which has plenty of empty space in the center, and has become a popular hang-out for man’s best friend to meet and play. 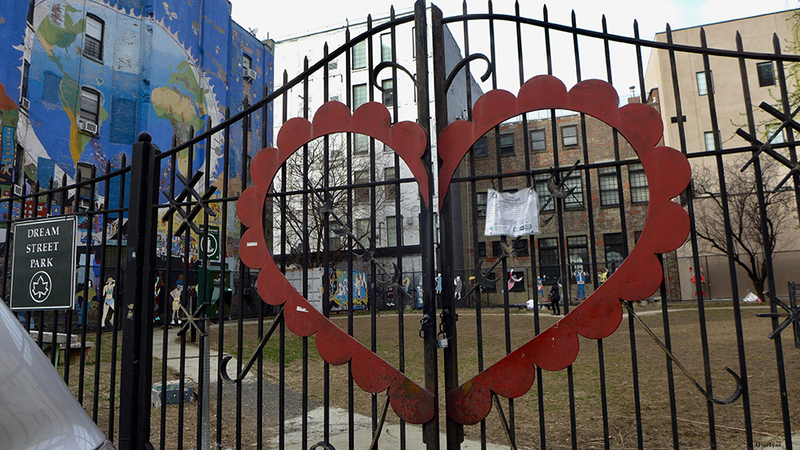 We can’t leave the Dream Street Park without mentioning a bit of local lore ~ the heart as a symbol of Evil, the voodoo goddess of love. What do you think? Next Next post: Public Art Fund Brings a Hot Dog Bus to DUMBO!